DuPont™ Tyvek® is ideal for both hazardous aerosols and non-hazardous liquids, dust and particles. It provides even more protection than our ProShield® garment. DuPont™ Tyvek® is also comfortable, whether you're working with harmful materials like lead, asbestos, or mold. The protection of Tyvek® is the proven solution. Welcome the next generation of DuPont™ disposable Tyvek® safety clothing into your facility to protect your workers from head to boots. These coveralls have been tailored to provide a more comfortable fit and greater range of motion. DuPont™ Tyvek® is ideal for both hazardous aerosols and non-hazardous liquids, dust, and particles. It provides even more protection than our ProShield® garment. DuPont™ Tyvek® is also comfortable, whether you're working with harmful materials like lead, asbestos, or mold. The protection of Tyvek® is the proven solution. Ideal for both hazardous aerosols and non-hazardous liquids, dust, and particles. 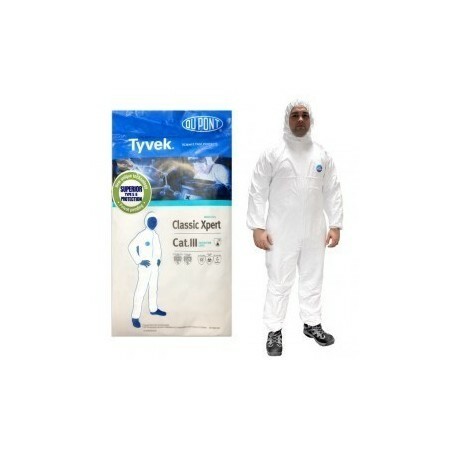 With Tyvek Coveralls you don't have to compromise. That's because Tyvek coveralls deliver the best balance of protection, durability, and comfort. Made using a proprietary manufacturing process, Tyvek features an inherent barrier. 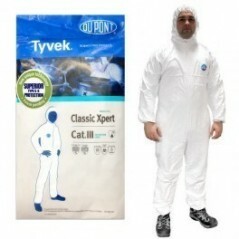 So, unlike other protective apparel fabrics, which have either a film or coating that can be easily scratched or worn away, Tyvek provides the barrier through the entire fabric. As a result, your protection is not compromised unless the fabric has been completely torn which isn't easy to do because of the strength and durability of Tyvek. Make sure you're getting Tyvek. Ask for it by name.